FilmDistrict releases Safe Haven nationwide on March 22nd, 2013. NYC MOVIE GURU: How important is realism to you in your films? Antoine Fuqua: I like realism, I’m kind of old-school I guess. I like films that feel real, I like to do the homework, the research, and try to make it as authentic as I can in the entertainment. The beauty of this is when I sat down with the guys I do know in the service, they have these conversations you’re thinking. I felt safe in what I was allowed to put on the screen because their job is prevention. They sit and have roundtables like you do with the filmmakers and go “What could happen, and how do we prevent that from happening.” So they gave me information like “These things could happen, if we didn’t have x, y, and z in place.” As a movie, we go “Well let’s take out these things, and make that happen.” We’re in good hands with our Secret Service, they’ve discussed these sorts of things quite a bit. NYC MOVIE GURU: Did you add something to the film stylistically that wasn't found in the script? AF: It wasn’t as real on the page. When I first read the script it was different in the sense of it was more sci-fi, they had some more “tricks.” Not in a bad way either, it just wasn’t my way. Instead of getting information from someone, you stick them with a needle, and I was like “No, that’s not how it works.” The realism of what terrorists do in a situation like that, what does it mean to take over a room? When you take over a room, fear always works, they know, and you can’t scare somebody by just yelling at them. You have to show them. So there were things that I would bring that were grounded, and the attack wasn’t the way it was until I got involved either – the attack was different. I got involved and sat with some guys, talked about that, and I asked them “How do I make this have resonance, how do I make you feel this could happen.” They re-wrote that for me. NYC MOVIE GURU: Would you conisder yourself to be a risk-taking filmmaker? AF: I think it’s really important to take risks. I think it’s dangerous because our business is unfortunately all about “How is it going to do at the box office,” and when you take a risk, and it’s not something people are familiar with, then people are afraid - but if you don’t take risks, then you’ll never know. It’s just going to be the same old same old. For me, I love taking risks, I don’t have that fear, I just do it and then let everybody else freak out. NYC MOVIE GURU: What do you think are the basic elements that turn an action thriller into a classic? AF: I think the classic movies all deal with the characters. You have to love your characters. The journey has to be complete. It’s the classic hero’s journey. I think whether it’s Star Wars, Apocalypse Now, or even Shane, there are characters that have a journey you go on with them. You can relate to them in some way in your own person. There’s a hero in all of us, and I think if you can connect with that, you can make a classic film because it’s a part of you. As far as the scenes themselves, those are the scenes that are memorable because you put your best foot forward to entertain, scare, or give you that “thing,” and if it connects then you have the opportunity to have something that will last. NYC MOVIE GURU: If you were re-cast the film with old-time actors, whom would you choose? You know what, it’s weird, because I love so many of those guys. You start thinking of guys like Cary Grant, people like that, but I would hire Jimmy Stewart to be [President Benjamin Asher]. He’s a personable guy, he’s the guy next door, he’s a guy you love and you want to throw into the fire and watch him get out. You want a normal person. I would hire somebody like that I think. I named my son after Marlon Brando, so I love Brando and all of them, but those guys are tough. Those are guys you believe can get this job done. 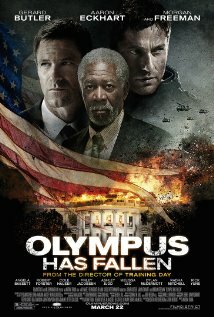 NYC MOVIE GURU: What were some interesting facts you learned from the specialists on-set while filming Olympus Has Fallen? AF: We, as a country since 9/11, I think have put some pretty amazing things in place to protect this country. Things I couldn’t talk about or put in the movie, those types of things. Those secrets stay with me, but they have things in place right now that are quite fascinating and like I said before, we’re in really good hands when it comes to something like that happening. That’s the thing I found most interesting. Like I said, they spend time daily, in rooms, with some of the smartest people around, talking about things that could happen – I mean from aliens invading the world. Seriously. They do have these conversations. They talk about these things, and it’s good to know that, it’s good to put these things in place. I think that 9/11 was such a wake up call for us to not put our guards down anymore. That’s the thing.